At the top of your to-do list whilst in Brazil might be to dance the samba during the rainbow spectacle of the Carnival in Rio de Janeiro. And don’t forget the famous Copacabana and Ipanema beaches. A visit to Sao Paulo should not be missed, nor should a tour to Iguazu falls. "very nice tour with perfect guide"
"O tour foi maravilhoso com paisagens inesquecívei e uma equipe com suporte e atendimento..."
Join a cooking class where you’ll learn to make (and eat) the best Caipirinhas! Tour Guanabara Bay on a 2 storey boat that’s been turned into a nightclub. Spend three days in survival training while camping in the Amazon Rainforest. Learn to Samba before parading along-side the locals in Rio’s carnival. Make your way across the catwalks of Iguaçu Falls, one of the most spectacular waterfalls in the world. Volunteer your time at one of the largest favelas in Latin America. See Rio de Janeiro from above as you hang glide from Tijuca National Park. Challenge yourself to climb the steps to the base of the Christ the Redeemer statue. 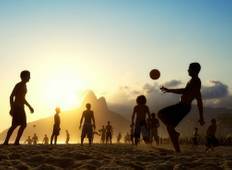 Try your hand at footvolley, a locally invented sport, on the world famous Ipanema beach. The official language of Brazil is Portuguese. Many Brazilians (particularly the younger generation) speak English. The currency in Brazil is called the Real. ATM’s are everywhere and credit cards are widely accepted. If a service charge hasn’t be added to your bill, leave around 10% as a tip. Dress conservatively for religious sites but other than that anything goes as long as it’s tidy. Don’t leave Brazil without a bottle of Cachaça, Pão de Mel honey cakes and a pair of custom Havaianas. Stick with bottled water. Brazilian water is good but the delivery system isn’t. In 2003, Brazil became the first country in the world to totally ban indoor tanning for anyone of any age. "My Big Dude tour was an absolute delight. I was lucky to be part of such a young crowd and it didn't feel like a tour at all. The visit to Rio was amazing and I would recommend this tour to anyone who wants to experience the beauty of Brazil." "I had a trip of a lifetime thanks to the amazing tour guide (Zoe) who made our Brazil trip memorable. It was a great value for money and she was accommodating in making suggestions to maximize our time and resources. Zoe was knowledgeable, friendly, took time to get to know us and made sure we have absolute fun during the tour. Everything was perfect. I definitely recommend this tour and I am even planning on doing another one." "Our tour guide (Bruno) gave us a spectacular trip. He took us to see the less fortunate parts of the town which is where he is from and it gave perspective on their lifestyle in a good way. Apart from that, the views from the top were marvelous and stunning. 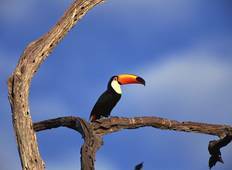 I highly recommend this tour for everyone to experience the beauty of Brazil."